To get to Angali beach you either go by your own vehicle (the downhill is incredibly steep so put on the brakes if you drive a scooter), by bus from Chora or by beach boat from Karavostasi. 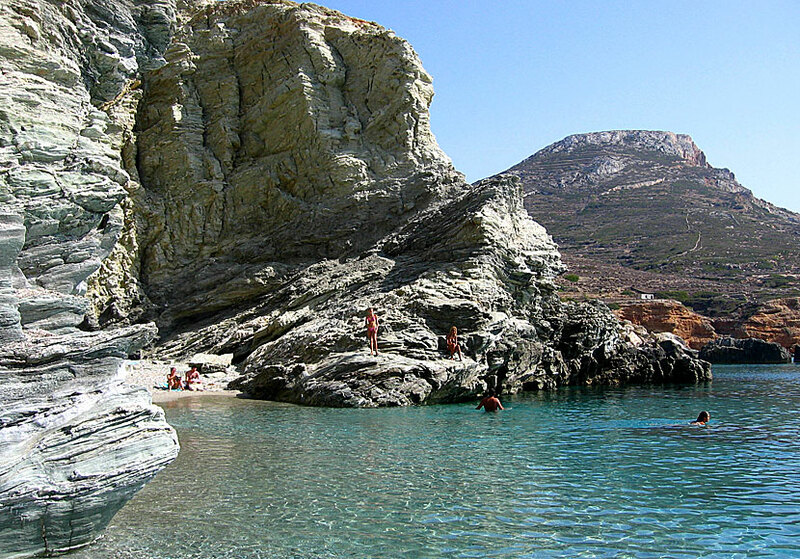 Angali is the most popular beach on Folegandros, and there are many reasons. The main reason is obvious, the beach is a really good one with lovely sand and crystal clear blue shimmering water. A few meters to the left of the main beach is a small beach surrounded by cliffs. (To get there, you have to wade in the water.) From the cliffs, you can dive into the inviting water. 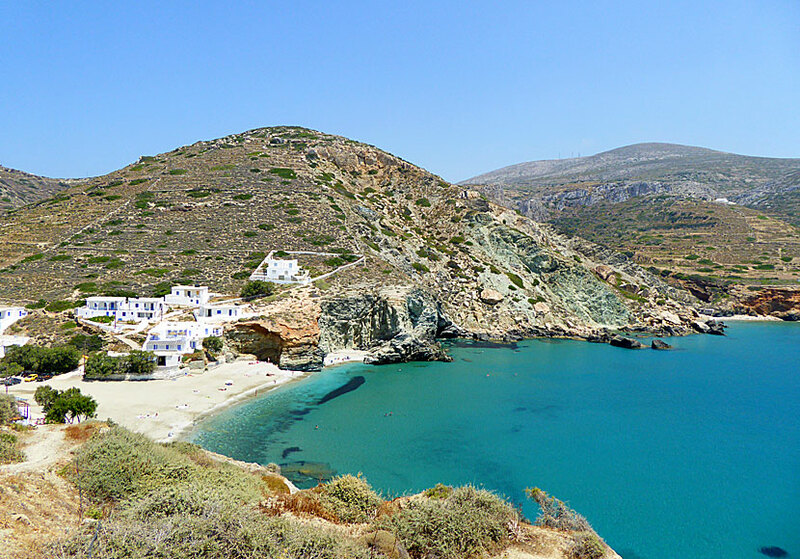 A bit further to the left is Fira, a pebbly beach (very large stones), reached via the water or a narrow path. The only drawback with Angali is that there is no shade. Fortunately, there are tavernas that gives shade, on the beach and a short way above. Before you arrive at the beach - where the bus stops - there is a shop and a cafe. For those who wants to stay a few nights there are two or three places to choose from. I have never stayed in Angali, but if I should do it, I had chosen Blue Sand Boutique Hotel & Suites that looks really attractive. View of beautiful Angali beach. At the far right is the small pebble beach. 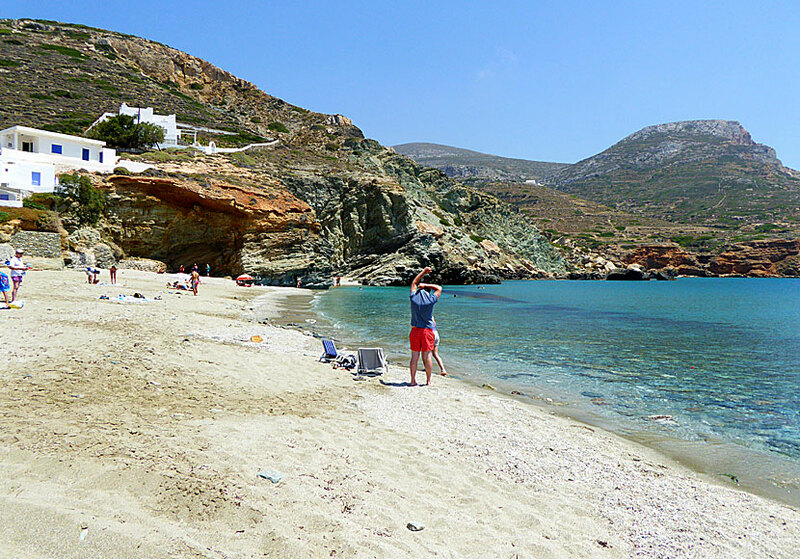 If you want to swim at another beach, make the short walk across the mountain to Agios Nikolaos beach.